You can discuss specific projects and changes using different types of discussions on GitHub Enterprise. 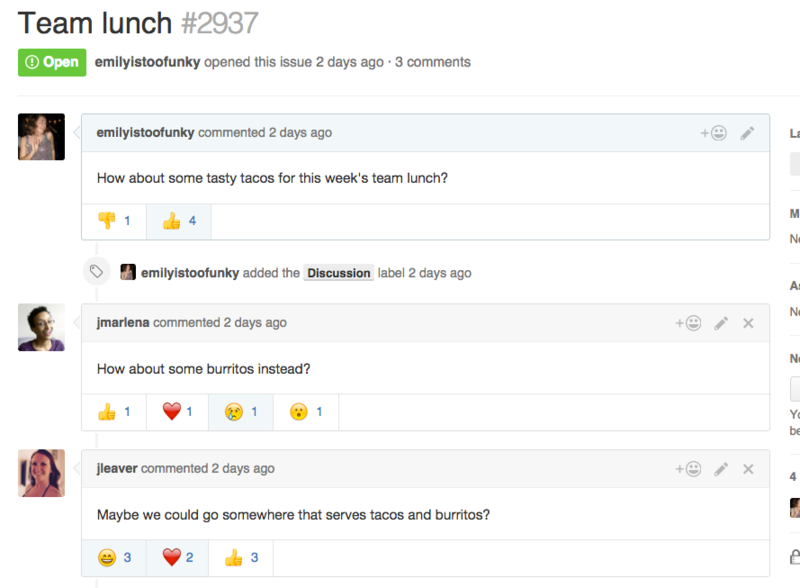 You can create and participate in issues and pull requests, depending on the type of conversation you'd like to have. Issues are useful for discussing specific details of a project such as bug reports and planned improvements. For more information, see "About issues." Pull requests allow you to comment directly on proposed changes. For more information, see "About pull requests" and "Commenting on a pull request." You can show your support or dissent for an idea in a conversation. When you add a reaction to a comment or the body of an issue or pull request, people subscribed to the conversation won't receive a notification. Before you open an issue or pull request, check to see if the repository has contributing guidelines. The CONTRIBUTING.md file includes information about how the repository maintainer would like you to contribute ideas to the project. Similar to contributing guidelines, the repository maintainer may have included a template for information to include in an issue or pull request. Completing the prompts from the template may help you get a better response from maintainers.